Publisher/Editor-in-Chief George Schmok gschmok@landscapeonline.com Editor Stephen Kelly skelly@landscapeonline.com Assistant Editors Breanna Belken bbelken@landscapeonline.com Greg Frank gfrank@landscapeonline.com Chante' McKowan cmckown@landscapeonline.com _______ In Memoriam Don Roberts, FASLA; Kay Tiller; Frank Manwarren; David Brian Linstrum; Lois E. Schmok; Otto Edward Schmok _______ Art Director Nicole Miller nmiller@landscapeonline.com Senior Graphic Designer Dylan Brinkley dbrinkley@landscapeonline.com Graphic Designer Jeremy Victor jvictor@landscapeonline.com _______ IT Technician & Graphic Design Jerry Short jshort@landscapeonline.com _______ Advertising/Marketing 714-979-LASN (5276) x113 • 714-979-3543 (Fax) Print Advertising Sales Jason Seaberg jseaberg@landscapeonline.com Clint Phipps cphipps@landscapeonline.com James McGehee jmcgehee@landscapeonline.com National Accounts Digital Sales Nathan Schmok nschmok@landscapeonline.com Marketing / Sales Assistant Samantha Flores sflores@landscapeonline.com _______ Executive Administration Amy Deane adeane@landscapeonline.com Office Administration Cynthia McCarthy cmccarthy@landscapeonline.com _______ Trade Show Manager Margot Boyer mboyer@landscapeonline.com Trade Show Sales & Marketing Representative Nathan Schmok nschmok@landscapeonline.com _______ Director of Data Development Frank Vazquez fvazquez@landscapeonline.com Data Management Francisco Alvarez Grace Bennett David Ibriham Ana Linares Chase Reed Calvin Scott Amy Timar Oscar Villela Alex McBratney _______ Contract Fulfillment Coordinator/Jr. Graphic Designer Ryan Moore rmoore@landscapeonline.com _______ Warehouse & Facilities Manager Javier Miranda jmiranda@landscapeonline.com John 15:13 … Greater love has no one than this: to lay down one's life for one's friends. Find Us Online: p u b l i s h e r 's l e t t e r 12 Landscape Architect and Specifier News LASN has long been a leader in searching out the latest and greatest in the field of Landscape; those being things that affect the design, installation and maintenance of developed lands. We pride ourselves on our relentless quest to bring you the newest products, projects, technology and state-of-the-art design philosophies and implementation strategies from across the country and around the world. In that quest, we have built a social network of more than 10,000 industry related followers and will be focusing even more energy to communicating with the profession through these media. 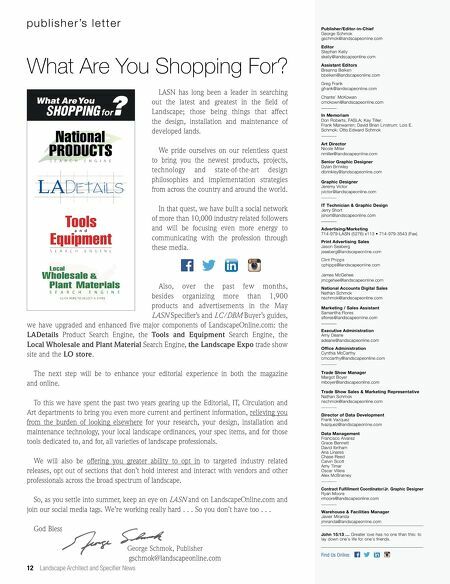 Also, over the past few months, besides organizing more than 1,900 products and advertisements in the May LASN Specifier's and LC/DBM Buyer's guides, we have upgraded and enhanced five major components of LandscapeOnline.com: the LADetails Product Search Engine, the Tools and Equipment Search Engine, the Local Wholesale and Plant Material Search Engine, the Landscape Expo trade show site and the LO store . 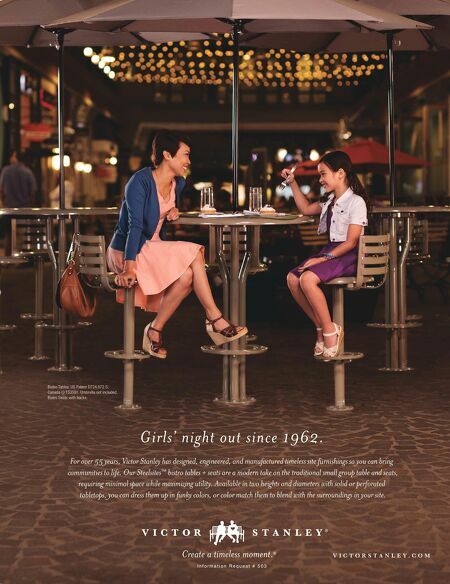 The next step will be to enhance your editorial experience in both the magazine and online. To this we have spent the past two years gearing up the Editorial, IT, Circulation and Art departments to bring you even more current and pertinent information, relieving you from the burden of looking elsewhere for your research, your design, installation and maintenance technology, your local landscape ordinances, your spec items, and for those tools dedicated to, and for, all varieties of landscape professionals. We will also be offering you greater ability to opt in to targeted industry related releases, opt out of sections that don't hold interest and interact with vendors and other professionals across the broad spectrum of landscape. So, as you settle into summer, keep an eye on LASN and on LandscapeOnline.com and join our social media tags. We're working really hard . . . So you don't have too . . . God Bless . . . George Schmok, Publisher gschmok@landscapeonline.com What Are You Shopping For?